In the East, Galerius dies and the Meletian Schism comes to Alexandria. In the West, Constantine become the Master of Rome. R. Williams, “Arius and the Meletian Schism”, The Journal of Theological Studies, Vol. 37, No. 1, April 1986, pp. 35-52. 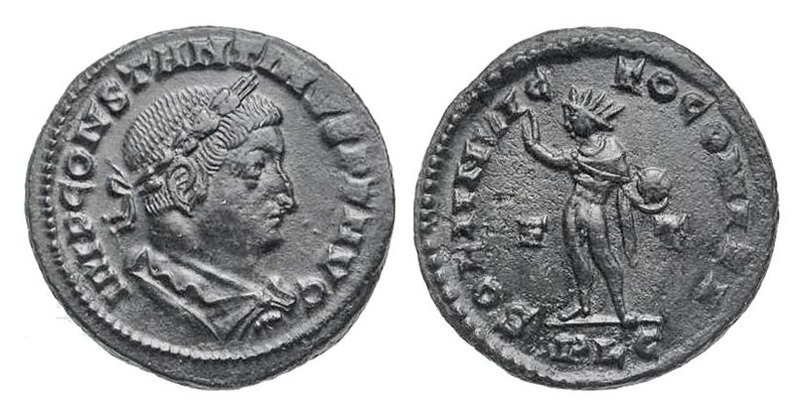 The Imperial Tetrarchy runs into problems with the rise of Constantine and Maxentius, each of whom will look to the Christians to support them against rivals. However, the Church has its own problems as both Rome and Carthage struggle to deal with the effects of the Persecutions and the Donatists come on to the scene. Image: reproduction of Constantine’s basilica at Trier. 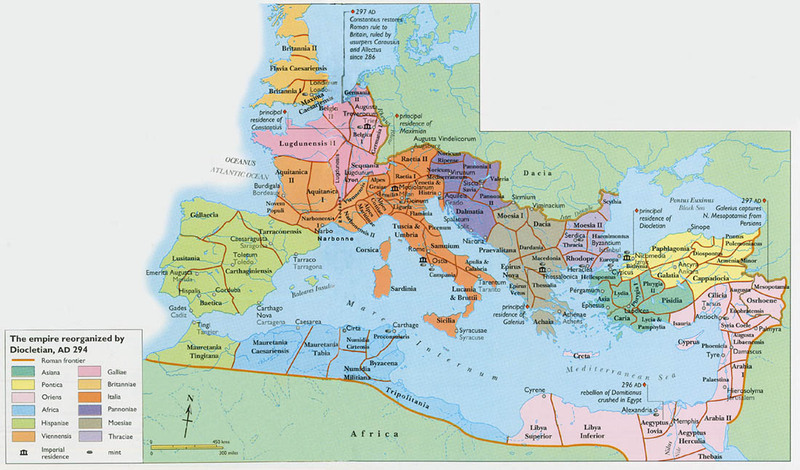 Map of provinces of Roman Empire. In North Africa, you can see province of Proconsularis Africa that supported Caecelian and provinces of Numidia that supported Majorinus. T. D. Barnes, “The Beginnings of Donatism”, The Journal of Theological Studies, Vol. 26, No. 1, April 1975, pp. 13-22. Alan Dearn, “The Abitinian Martys and the Outbreak of the Donatist Schism”, Journal of Ecclesiastical History, Vol. 55, No. 1, January 2004, pp. 1-18. Peter Iver Kaufman, “Donatism Revisited: Moderates and Militants in Late Antique North Africa”, Journal of Late Antiquity, Vol. 2, No. 1, Spring 2009, pp. 131-142. Robert Wisniewski, “Lucilla and the Bone: Remarks on an Early Testimony to the Cult of Relics”, Journal of Late Antiquity, 4.1, Spring 20011, pp. 157-161. The Great Persecution also effected the Western half of the Roman Empire. While the territory of Constantius Chlorus was only mildly affected, the Christians of Italy and North Africa faced a more difficult situation. Some Christians chose death over submission to the Imperial authorities. Other Christians will abandon their faith in order to preserve their lives. One of those might have been the bishop of Rome Marcellinus. However, as serious as the persecutions were, they won’t keep bishops from meeting at the important Council of Elvira and laying down important future laws for the Church. Image: 4th century icon of Christ between Peter and Paul. At the bottom of the icon are images of various Roman martyrs. Maureen A. Tilley, Donatist Martyr Stories: The Church in Conflict in Roman North Africa, Liverpool: Liverpool University Press, 1996. The Great Persecution begins in the Roman Empire as the Imperial Government throws its weight against the Christians. This week: the initial persecution in the Eastern Half of the Empire. In the years prior to the outbreak of the Great Persecution, the martyrdoms of the Theban Legion and Saint Maurice, Saint Maximilian, and Saint Marcellus demonstrated that it was difficult for the Christian soldiers to serve both Christ and the Emperor. In this episode, we also begin our look at how Armenia became the first country to adopt Christianity.